A report by a top data analysis site has revealed that, as per the latest government data, close to 66% of the all the wage payments made under the National Rural Employment Guarantee Scheme (NREGS), a flagship programme of the former UPA government, were delayed in the year 2015-16. Prepared by Rakesh Dubbudu, the report further reveals that close to 10 per cent of the wage payments were delayed for more than three months, and only 1.2 per cent of compensation has been paid against the delay. 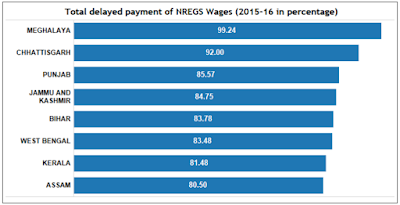 Based on the annual performance report of the NREGS scheme for fiscal 2015-16, which was released recently by the NDA government, the report says, "Rs 35,062.93 crore was the total wage payments for the year 2015-16. Out of this amount, payment of 65.6 per cent or Rs 23,017.6 crore was delayed beyond the stipulated 15 days." 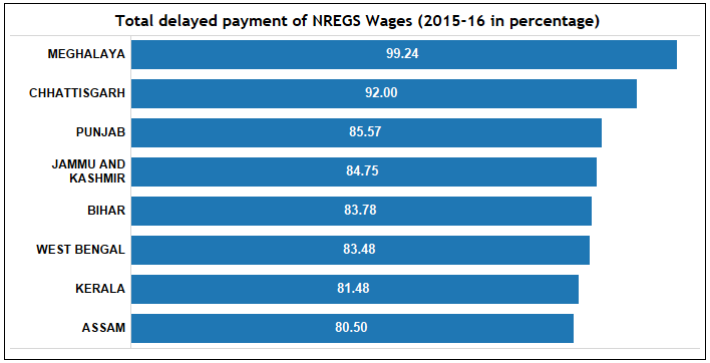 Pointing out that in as many as 14 States/union territories (UTs), more than 75 per cent of the wage payments in 2015-16 were delayed beyond the stipulated 15 days", the report shows that Meghalaya delayed topped the list with a delay in 99.2 per cent of payments, followed by Chhattisgarh (92 per cent) and 85.6 per cent in Punjab. The report says, "More than 80 per cent of the wage payments were delayed in 10 different States/UTs", adding, "The percentage of wage payments delayed was more than the national average in 20 different states/UTs." According to the report, "Manipur performed the best among states with only 16.9% wage payments delayed beyond the 15 day limit", adding, "Less than 50 per cent of the wage payments were delayed in only seven States/UTs." In absolute numbers, the report says, "Out of the 38.6 crore wage payment transactions made in 2015-16, 24.1 crore transactions were delayed beyond the stipulated 15 days (around 62 per cent)." It adds, "More than 90 per cent of the transactions were delayed in three States/UTs and more than 80 per cent were delayed in 12 states/UTs." The report says, "More than 60 per cent of the transactions were delayed in 23 different States/UTs", with less than 20 of the transactions getting delayed in only two states -- Manipur and Andhra Pradesh. In value terms, the report says, an amount of Rs 3,397.8 crore was "delayed" for payment of wages in 2015-16 "for more than three months -- which is 10 per cent of all the wage payments." The report's analysis shows that the North-Eastern States suggested an interesting trend, with more than 70 per cent of the wage payments having been delayed for more than three months in Arunachal Pradesh, the highest for any State. "Next in the list were Meghalaya, Nagaland and Assam", the report says, adding, however, "At the same time, Manipur and Mizoram reported less than 1 per cent of the wage payments delayed for more than three months." The report says, "As per the new guidelines, the NREGS workers are entitled to receive delay compensation at the rate of 0.05 per cent of the unpaid wages per day for the entire duration of delay beyond the 16th day." The report calculates, "A total of Rs 444.38 crore is the payable amount of compensation for a total of 821 crore delay days. Out of this amount, only Rs 9.6 Crore is approved (about 2.2 per cent) and only Rs 5.1 crore (about 1.2 per cent) is paid so far." "Not a single rupee of delay compensation is approved in 19 States/UTs though Rs 127 crore of delay compensation is pending from those States."